Projected first for the Alamo Bowl, then the Cotton, Washington instead will take on Penn State in the Dec. 30 Fiesta Bowl in Glendale, AZ. Projected originally to play in the Alamo Bowl, and most recently in the Cotton, Washington instead will play opposite Penn State in the Fiesta Bowl in Glendale, AZ., Saturday, Dec. 30. That announcement came Sunday following the College Football Playoff Committee’s choice of national semifinal pairings, No. 1 Clemson vs. No. 4 Alabama and No. 2 Oklahoma v. No. 3 Georgia. The Huskies received the Fiesta nod largely because No. 5 Ohio State, omitted from the national semifinals Sunday in favor of the Crimson Tide, has appeared in the past two Fiesta bowls. The Buckeyes now will play USC in the Dec. 29 Cotton Bowl in Dallas. Washington State, a decisive loser to Washington in the Apple Cup but a 9-3 team, will take on Michigan State in the Holiday Bowl Thursday, Dec. 28 at 6 p.m., PT. The Cougars will be playing in their third consecutive bowl game under coach Mike Leach and for the second time in as many years in San Diego. The 10-2 Huskies, who finished 11th in the final CFP rankings and 12th in the final regular-season Associated Press rankings, both released Sunday, will face the 10-2 Nittany Lions at 1 p.m. PT on ESPN. It will mark Washington’s third meeting with Penn State and its first since the 1983 Aloha Bowl won by the Lions 13-10. “I can’t tell you how excited and honored we are to go there,” said Petersen. “There is no better bowl game than this one. When we heard today that we were coming here there was a lot of jumping around and excitement . . . until we found out we were playing Penn State. But this is what you play for. To play against a really storied program is thrilling on our end. Our kids are extremely thrilled to be a part of this. Washington will be appearing in its 37th bowl overall (18-17-1) and its eighth in a row, all in different bowls (2010 Holiday, 2011 Alamo, 2012 Las Vegas, 2013 Fight Hunger, 2014 Cactus, 2015 Heart of Dallas, 2016 Peach, 2017 Fiesta). This will mark Washington’s first appearance in the Fiesta Bowl, but not its first at University of Phoenix Stadium. The Huskies played the 2014 Cactus Bowl in the venue, home to the NFL Arizona Cardinals. While UW has never appeared in the Fiesta, Petersen has twice done so coaching at Boise State. Petersen won both games, including a huge upset of Oklahoma Dec. 1, 2007. 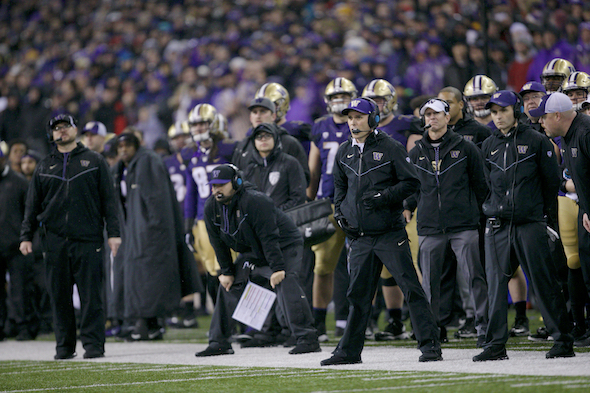 Petersen is also 1-2 in bowl games at Washington with a win in the 2015 Heart of Dallas Bowl (Southern Mississippi) and losses in the 2014 Cactus (Oklahoma State) and 2016 Peach (Alabama). Washington is in its second major bowl in as many years following last year’s game against Alabama in the Peach, a national semifinal. The last time UW played in major bowls in consecutive years: 1990 Rose (Iowa), 1991 Rose (Michigan), 1992 Rose (Michigan). Penn State, No. 9 in the final CFP rankings, ripped through the early part of its schedule, outscoring its first seven opponents 280-67 while rising to No. 2 in the AP poll. But then the Nittany Lions gave away a fourth-quarter lead and lost to Ohio State (39-38), and followed that with another loss at Michigan State (27-24). Those losses removed Penn State from national semifinal consideration. Penn State, which scored 40 or more points six times, completed its season by trampling Rutgers (35-6), Nebraska (56-44) and Maryland (66-3), and with a running back, Saquon Barkley, likely headed for the Heisman Trophy ceremony. Barkley rushed for 1,134 yards and scored 16 touchdowns. Barkley’s stat line will set up one of the early Fiesta Bowl storylines since Washington will enter the game with the nation’s No. 1 rushing defense, allowing 92.3 yards per game and 2.63 yards per rush. Penn State will be making its seventh appearance in the Fiesta and has a 6-0 record. The Nittany Lions are early 4½-point favorites over UW. UW and Penn State played one common opponent: Rutgers. The Huskies won 30-14 and Penn State won 35-6. The Cougars will be making their fourth appearance in the Holiday, having played there in 1981 (lost to BYU 38-36), 2003 (defeated Texas 28-20), and 2016 (lost to Minnesota 17-12). The Spartans finished No. 16 in the final CFP rankings released Sunday while WSU came in at No. 18. The Spartans finished the regular season with a 9-3 record (7-2 Big Ten) and are in position to record their sixth double-digit win season in the last eight years with a victory in the Holiday Bowl. This will mark the 10th bowl bid in 11 seasons under Mark Dantonio, who owns a 99-45 record and will be looking for his 100th win as head coach at Michigan State. The Holiday will be the eighth meeting between Michigan State and Washington State. MSU leads the all-time series, 5-2, with the last meeting in 1977. This will be the first between the two teams in a bowl game. Michigan State’s biggest win this season was a 27-24 verdict over No. 9-ranked Penn State in East Lansing Nov. 4. The Spartans also defeated Michigan 14-10 while losing to Notre Dame, Northwestern and Ohio State. Washington State will be playing in its 14th bowl game and fourth under Leach. The Cougars are 7-6 overall in bowls and 1-2 under Leach. Petersen Sunday named Bush Hamdan as the Huskies’ new offensive coordinator and quartebacks coach, replacing Jonathan Smith, who departed last week to become head coach at his alma mater, Oregon State. Hamdan spent the 2015 and 2016 seasons on the Washington staff as the wide receivers coach and then became quarterbacks coach of the Atlanta Falcons. He will return to Montlake once Atlanta’s season ends. He has also coached at Arkansas State, Florida, Maryland and Davidson. Hamdan played quarterback at Boise State, earning letters in 2006, 2007 and 2008. A great bowl opportunity against a great team. Couldn’t ask for more. Well . . . .they could wipe out Penn and please me greatly, but I’m not the type to count my chickens before they hatch. Go Dawgs ! I’ve been watching Husky football for 65 years and am enormously pleased at what Coach Petersen has done with this team. Hamdan or anyone else will be a step UP from Smith. If he lives in the weight room in the off season, Jake may benefit greatly from Hamdans hire and might make the NFL. 2014 (January 2015) Cactus Bowl was at Sun Devil Stadium in Tempe.